Dr Robot presents SCOUT, a rugged wheeled WiFi robot equipped with two gripping arms that optionally provide the robot with either one or two wrist-mounted CMOS cameras. Combining mobility and a new ability to grasp and manipulate, SCOUT offers users broad versatility in its application and recently starred in Universal Picture's American Pie: Band Camp. 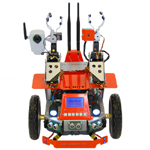 SCOUT is a ready to use mobile robot platform designed for remote monitoring/patroling applications requiring object manipulation or other direct physical interaction with the robot's surroundings. The base design matches the Dr Robot unit that appeared in the most recent American Pie film, with improvements noted below. An improvement provided with the current model SCOUT is a wrist-mounted camera that greatly facilitates remote manipulation of objects. Optionally, you can choose to have cameras on both wrists, maximizing the robot's ability to survey its surroundings. With their position coincident to the robot's gripping digits, the cameras uniquely enable remote users to get an eye on whatever the robot is reaching toward. Note: The wrist camera can be seen just below the gripper on the right side of the photo. the optional second camera installes on the left side of the photo. SCOUT travels at a top speed of 75 cm/sec and has 6 infrared distance sensors and 3 ultrasonic rangefinders onboard, but also has a bumper equipped with shocks in case of an unavoidable collision. Two lamps on the front of the robot also provide near-field illumination. As is standard on all our monitoring robotic systems, SCOUT has an onboard speaker and microphone, both of which support two-way audio communication. The SCOUT package also includes a charging unit for Ni-MH battery system. 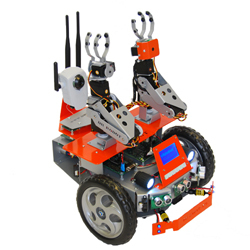 SCOUT functions by wireless connection to a notebook or desktop PC equipped two joystick controllers (included) that separately control the robot and arm motion. 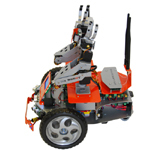 Software modules enable a user to see/hear via the robot, and talk through the robot's onboard speaker. A camera mounted on the wrist of right arm to provides viewing from virtually any perspective. With its integrated high bandwidth (11Mbps) WiFi 802.11 wireless module, the system can upload all sensor data (including encoder sensor readings) to a PC or server at rates in excess of 10Hz. Similarly, streaming audio (8Hz x 8bits) and video (up to 4 fps) either for direct monitoring or for processing by high-level AI schemes is a snap. Commands and instructions sent to the SCOUT via the same wireless link also pass at rates exceeding 10Hz, providing real-time control and access. SCOUT includes all WiRobot development software components (for MS Windows 2000 and up), enabling easy access to all data and information in a standard Microsoft Windows programming environment (e.g., MS VB and VC++). Under the approach of using a separate PC for high-level control, there are no longer onboard restrictions on a mobile system’s processing power, memory and storage. For users of non-Windows operating systems (e.g., Linux), Dr Robot will provide the raw communication protocol for direct integration with any other system/device. Like Dr Robot's other advanced robot systems SCOUT can be used to develop a specialized intelligent robotic assistant, security robot or simply use it as a platform for a variety of projects built around applications such as human-machine interaction, mobile system navigation, robot behavior, image processing, object recognition, voice recognition, teleoperation, remote sensing, map building and localization etc. SCOUT is fully integrated and each robot is fully assembled and tested prior to shipping so that it arrives ready for use.